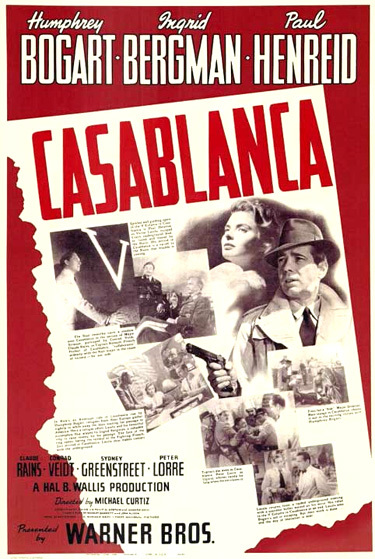 The nominations included Best Actor (Humphrey Bogart), Best Supporting Actor (Claude Rains), Best B/W Cinematography (Arthur Edeson, known for The Maltese Falcon (1941)), Best Score (Max Steiner, known for Gone With the Wind (1939)), and Best Film Editing (Owen Marks). The dark-horse film won three awards (presented in early March of 1944): Best Picture (producer Hal B. Wallis), Best Director, and Best Screenplay. Bogart lost to Paul Lukas for his role in Watch on the Rhine. And Bergman wasn't even nominated for this film, but instead was nominated for Best Actress for For Whom The Bell Tolls (and she lost to Jennifer Jones in The Song of Bernadette). Bogart had made three other films in 1943: Sahara, Action in the North Atlantic, and Thank Your Lucky Stars.